Graphene is a one-atom thick sheet of carbon atoms arranged in a hexagonal lattice. UC Riverside physicists have found a way to induce magnetism in graphene while also preserving graphene's electronic properties. Credit: Shi Lab, UC Riverside. Graphene, a one-atom thick sheet of carbon atoms arranged in a hexagonal lattice, has many desirable properties. Magnetism alas is not one of them. Magnetism can be induced in graphene by doping it with magnetic impurities, but this doping tends to disrupt graphene's electronic properties. Now a team of physicists at the University of California, Riverside has found an ingenious way to induce magnetism in graphene while also preserving graphene's electronic properties. They have accomplished this by bringing a graphene sheet very close to a magnetic insulator - an electrical insulator with magnetic properties. "This is the first time that graphene has been made magnetic this way," said Jing Shi, a professor of physics and astronomy, whose lab led the research. "The magnetic graphene acquires new electronic properties so that new quantum phenomena can arise. These properties can lead to new electronic devices that are more robust and multi-functional." The finding has the potential to increase graphene's use in computers, as in computer chips that use electronic spin to store data. Study results appeared online earlier this month in Physical Review Letters. The magnetic insulator Shi and his team used was yttrium iron garnet grown by laser molecular beam epitaxy in his lab. The researchers placed a single-layer graphene sheet on an atomically smooth layer of yttrium iron garnet. They found that yttrium iron garnet magnetized the graphene sheet. In other words, graphene simply borrows the magnetic properties from yttrium iron garnet. Magnetic substances like iron tend to interfere with graphene's electrical conduction. The researchers avoided those substances and chose yttrium iron garnet because they knew it worked as an electric insulator, which meant that it would not disrupt graphene's electrical transport properties. By not doping the graphene sheet but simply placing it on the layer of yttrium iron garnet, they ensured that graphene's excellent electrical transport properties remained unchanged. 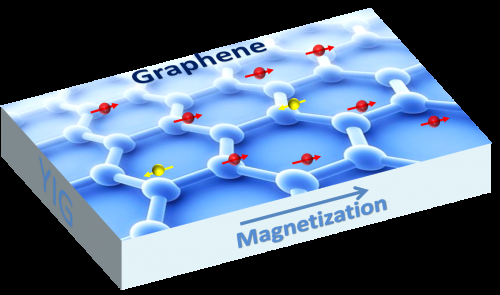 In their experiments, Shi and his team exposed the graphene to an external magnetic field. They found that graphene's Hall voltage - a voltage in the perpendicular direction to the current flow - depended linearly on the magnetization of yttrium iron garnet (a phenomenon known as the anomalous Hall effect, seen in magnetic materials like iron and cobalt). This confirmed that their graphene sheet had turned magnetic.